The Woodland Tree Foundation is offering FREE shade trees to residents of Woodland. The goal of the Campaign is to conserve energy through the shade of 1,200 new trees in the City of Trees. with the subject line: “Tree Request.” Include your name, telephone number and street address in the body of the email. You may also call (530) 341-8436. WHAT: Medium and large size shade trees are offered. The brochure, “A Tree Guide for Woodland“ shows many of the shade trees available. WHERE: Free shade trees are available to residents of Woodland on a first come, first served basis. Trees may be planted in front or backyards as long as they will shade the east, west or south side of homes. Trees may also be planted on the north side of a home if that is also the street side. There must be five to 10 feet clearance between a tree and sidewalks, driveways, foundations and underground utilities. 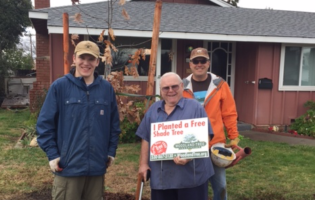 For tree plantings in the planting strips between the street and sidewalk, contact the City of Woodland by clicking here. WHY: To shade and cool homes for energy conservation, clean the air, reduce greenhouse gases and beautify Woodland’s neighborhoods. WHEN: Sign-ups for trees are being taken now. Planting of the trees by volunteers will take place on Saturday mornings November – April 2019, with dates to be announced. 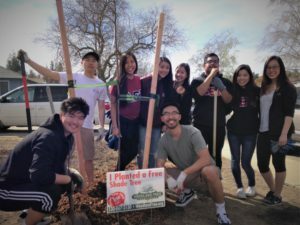 WHO: The Woodland Tree Foundation’s Neighborhood Shade Tree Campaign is made possible in partnership with the John and Eunice Davidson Fund, the City of Woodland, Tree Davis, and the California Department of Forestry & Fire Protection.